The board of the Fiber Broadband Association was honored to present President & CEO Heather Burnett Gold with a Lifetime Achievement Award in recognition of her 34 years as a leader in the fiber industry. The award was presented at the Fiber Connect Conference on June 4th, 2018. 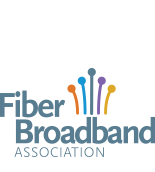 The Chairman’s Award, given at the discretion of the Chairman of the Fiber Broadband Association Board of Directors, singles out an individual or company that has shown tremendous effort to promote, educate or accelerate fiber-to-the-home. Four years ago, Detroit had almost no fiber infrastructure and was one of the most disconnected cities in America. Rocket Fiber has fueled Detroit’s resurgence by taking a leadership position, investing in fiber broadband infrastructure to deliver affordable, high-speed gigabit internet services to Detroit’s businesses and residences while also investing in the social infrastructure of Detroit’s entrepreneurs and small businesses.FCC Commissioner Brendan Carr recently recognized Rocket Fiber’s efforts. "Detroit is a great story of a comeback city that I think broadband has really played a role, helping spur some of those businesses that have come back to city," Carr said. and J. Michael Hill, CEO of On Trac, Incorporated. The Star Award recognizes a person, community or company that has gone above and beyond what is expected in the advancement of fiber to the home. Under John’s leadership, MetroNet has committed to working with policymakers to turn Lexington, Kentucky into a gigabit city, planning to invest as much as $70M over the next three years to run fiber to over 90,000 homes and businesses. The Photon Award recognizes an Fiber Broadband Association member who, through their volunteer contribution, has demonstrated a high level of dedication to the organization and contribution to the industry. Jennifer expertly organized and supported the Fiber Broadband Association’s advocacy and leadership of the Federal Communications Commission’s Broadband Deployment Advisory Council subcommittee on a State Model Code. Over the past year, both these companies have demonstrated an exemplary commitment to the industry and its continued success, most notably by Verizon’s recent $1.05 billion purchase agreement with Corning for next generation optical solutions. 2016 - Bob Whitman, Vice President of Global Carrier programs for Corning. Mr. Whitman was a founding member of the FTTH Council and served on the first board of directors. He was instrumental in the development of the Council’s original business case model and drove the globalization of the Council. As an expert in the economics of FTTH network deployment, Mr. Whitman is both highly respected within his company and throughout the industry. 2015 - CenturyLink, an organization that has carefully and quietly rolled out service to almost 20 communities across the United States. Since its announcement of its first Gigabit pilot in mid-2013, CenturyLink has been providing high-speed broadband service to underserved communities. 2014 - Google Fiber, a previous FTTH Council award winner, because of the powerful impact they have had on the fiber-to-the-home industry, taking a chance as a non-incumbent service provider and following through on their commitment to Kansas City and other publically announced cities. Google is also recognized for creating a novel and working business model that has inspired other network operators and scores of municipalities to consider FTTH either on their own or in these types of public/private partnerships. Jill Szuchmacher, Director of Business Development accepted this award on behalf of Google Fiber. 2013 - Jackson Energy Authority (JEA), for its near ten years of FTTH leadership. In 2004, JEA decided to build on a reputation for utility service delivery--they also deliver electric, water, wastewater, and natural gas services—and began to deploy fiber, becoming the first fiber-to-the-home network in the state of Tennessee. The network attracted worldwide attention and became a model for showcasing technology while mentoring new entrants in the industry throughout the U.S. and the world. They have established and maintain a reputation for excellence and commitment to communities in their service areas, connecting schools, public safety systems and health care facilities to ultra high-speed bandwidth. Ben Lovins, Senior Vice President of Telecom accepted the award on behalf of Jackson Energy Authority. 2012 - Jim Baller, the president of the Baller Herbst Law Group in Washington, DC, represents clients in a broad range of communications matters nationally and in more than 35 states. He was also the founder of the US Broadband Coalition, a large and diverse consortium of organizations of all kinds that forged a broad consensus on the need for a national broadband strategy and then developed the framework reflected in the FCC’s National Broadband Plan. The FTTH Council is proud to honor him for his relentless promotion and pursuit of community broadband and of faster networks for everyone. His efforts have paved the way for the deployment of all-fiber networks across the country. 2011 - Google, Inc. for being one company that has done more than any other organization in pointing out the critical importance of all-fiber networks to community leaders and citizens across the country, and to get them active in promoting the value of fiber for their future. More than 1,100 communities applied to participate in Google's gigabit FTTH pilot project. And today, people in the Kansas City area are anticipating the rollout of a next-generation, superfast network that is holding great promise for economic development. 2010 - Hiawatha Broadband Communications for its role in ensuring that our national policymakers know how important all-fiber access is to America's telecommunications networks, our economy, our national competitiveness, and our future as a high-tech leader. 2009 - Verizon Communications Inc. for remaining steadfast in its commitment to fiber to the home in a year where many companies struggled with making the right decision for their future and for continuing to move aggresively into new markets. 2008 - Because of the significant contributions made to the industry in 2008, two Chairman's Awards were given to GVTC of Texas and Dr. Michael Browder, CEO of Bristol Tenneessee Essential Services (BTES), for their tremendous effort to promote, educate and accelerate fiber. 2007 - Jim Farmer, CTO of Wave7 Optics, for his outstanding contribution to the success and growth of the FTTH industry. 2006 - The State of Texas for passing statewide video franchise reform. As a result of this pioneering effort, other states have passed similar reform bills which have resulted in an increase in FTTH deployment. 2005 - Mayor-President Joey Durel, Lafayette City-Parish, Louisiana, for his unwavering effort to overcome legal issues in the deployment of fiber to his community which resulted in a public campaign and subsequent referendum in which citizen voted in support of the Lafayette Fiber to the Home project. Founded in 1880, Bell Canada is the country’s largest communications company, offering broadband fiber services such as Fibe TV and Gigabit Internet to millions of Canadians. Expanding fiber-to-the-home throughout urban centers in seven provinces, including the country’s largest cities Toronto and Montréal, Bell Canada is a North American leader in broadband investment and innovation. 2016 - Cincinnati Bell for its leading FTTH services offered under the brand name Fioptics. 2015 - CSpire Communications in recognition of their expansion into rural markets across the state of Mississippi. 2013 - Kansas City, Missouri and Kansas City, Kansas, for giving the rest of the country a model of civic engagement to follow. When Google announced they would be bringing their new fiber product to the area, these communities did not wait for the benefits of next generation networks to just appear. The mayors of these communities established a Bistate Innovations Team, charged with recommending ways to take full advantage of the coming next generation network infrastructure. The group established a playbook and handed over responsibility for executing those plays to a community-driven, digital leadership network called KC Digital Drive. That group has hit the ground running, working to put a social infrastructure firmly in place as the physical infrastructure is under construction. Aaron Deacon, Managing Director of KC Digital Drive and former Mayor of KCMO, Joe Reardon accepted the award on behalf of the cities. 2012 - Gig.U, this year's award recognizes the University Community Next Generation Innovation Project - commonly known as Gig.U - which has been making huge waves in its efforts to accelerate the deployment of ultra high speed networks to leading U.S. universities and their surrounding communities. The brainchild of Blair Levin, who managed the preparation of the National Broadband Plan at the FCC, Gig.U is a consortium of more than 30 leading research universities from across the U.S. The organization is working tirelessly to organize and improve local networks in these communities into gigabit powerhouses that can fuel innovation, economic growth and improvements in health care and education. The organization has been a valued partner of the FTTH Council in promoting the expansion of ultra high speed networks. 2011 - Legend Conference Planning, the FTTH Council recognizes the important contributions of Legend Conference Planning - which for seven years has operated the FTTH Council secretariat and has organized the annual FTTH Conference & Expo - to the success of the FTTH Council's industry promotion efforts. Indeed, the Council relies heavily, day after day, on Legend's ongoing contributions of knowledge, ideas, strategic direction and leadership. When the final chapter is written on the enormous success and advancement of fiber to the home in the 21st century, it will include the important role played by Legend Conference Planning. 2010 - EPB, which fought and prevailed over some of the toughest challenges imaginable in their quest to bring next-generation all-fiber connectivity to the Chattanooga metro area, which is going to benefit in huge ways because their citizens have all-fiber service, all-fiber bandwidth, and all that entails with regard to keeping competitive in the 21st century economy. 2009 - EATEL, an FTTH pioneer in Gulf South, who has repeatedly repaired and rebuilt their network after massive hurrican damage from Katrina, Ruth and Gustav, and assisted other Louisiana service providers to restore their networks. 2008 - Broadband Properties Magazine, for its contribution to educating and promoting the benefits of fiber to the home and fiber to the premises technology both in the magazine as well as at its annual Broadband Properties Summit held each spring. 2007 - Michael Render, CEO and President of Render Vanderslice LLC, for his extensive research of North American FTTH deployments. 2006 - Tom Cohen of the Washington legal firm, Kelley Drye & Warren LLP, for his influential advocacy in testimony before the FCC and the House of Representatives which resulted in the successful passing of the Telecom Reform Bill (Barton Bill). 2005 - Mayor Graham Richard, Fort Wayne, Indiana, whose collaboration with Verizon resulted in a FTTP overbuild for Ft. Wayne and a subsequent economic revitalization plan around the Verizon deployment. Kevin has expertly organized and led the Technology Committee, demonstrating true organizational excellence through his Action Item Register (AIR). 2016 - Scott Jackson, BDM Smart Grid, Graybar. Mr. Jackson has been a member of the Council for over ten years — seven of which he served in leadership positions — and has always been passionate about helping a wide range of new providers determine how to deploy all-fiber networks. 2015 - Ian Williams, Senior Design Specialist of Telus. Ian has impressively balanced his role as a leader in his company’s deployment of fiber-to-the-home with his active role as a FTTH Council member. 2014 - J. Michael Hill CEO and President of On Trac. Mike has worked tirelessly on behalf of the FTTH Council for over 10 years, serving on the Board for over 8 years. 2013 - Liza Poe, Director of the LATAM Chapter Marketing Committee and CALA Market Manager for Corning Telecom. Liza produced the last two highly successful Annual LATAM Conferences and was also recognized for her work on producing information on Fiber to the Home for carriers and vendors in Latin America in Spanish and Portuguese. 2012 - Gilberto Guitarte, of TE Connectivity. It takes special people to get out in front of the pack - to lead, to innovate and to work hard, day after day, to make this growth happen. As the Latin American region moves decisively into the future with fiber, the FTTH Council's LATAM Chapter has been leading the charge. Under Chairman Gilberto Guitarte's leadership, the chapter has been growing and becoming more influential year by year. Gilberto Guitarte is a force for faster and better broadband throughout Latin America, and for all of the economic and social progress that will bring to the region, and therefore is most deserving of this year's Photon Award. 2011 - John George of OFS, has headed up the organization of the learning program at the annual FTTH Conference & Expo - all the track sessions, industry panels and white papers. It is an enormous amount of work. It takes a lot of skill and commitment of time. And John George has been there for the industry, every year, making the commitment, doing the work, and leading the conference to great success. 2010 - Joseph Jones of OnTrac, Inc., the chair of the Council's Planning and Marketing Committee, who has undertaken enormous responsibility and committed extensive time and attention to ensuring the success of our conferences and events. 2009 - Nelson Saito, Furukawa do Brazil, Gilberto Guitarte of TE Connectivity, and Peter Ballhaussen of Corning Cable Systems, who have been instrumental in launching the FTTH Council's Latin America Chapter in May 2009, with a mission to help accelerate deployment in countries such as Brazil, Chile, and Argentina, while reaching out to promote the benefits of FTTH for economic growth, education and health care in the region. 2008 - Kevin Bourg, Director of Global Sales, Enablence Wave7 FTTx Networks, and Laura Pepper, Marketing Specialist of Carina Technologies, for the many volunteer hours as project leads for both the Fiber-Powered Pavilion and the Home Networking Zone. 2007 - Mark Turner, Manager Consulting Engineering, Corning Cable Systems, for his instrumental work to develop the Home Networking Zone and for his volunteer efforts in chairing the Technology Committee which produced a number of white papers and technical webinars throughout the year. 2006 - Michael Kunigonis, Product Line Manager-Access, of Corning Cable Systems, was the 2006 honoree for his extraordinary dedication, time and commitment in his volunteer efforts to advance the Council and its mission. 2005 - Patrick Sims, Senior System Project Engineer, ADC, for volunteering in various capacities and for his work as the Chair of the FTTH Council Planning Committee.